It is not certain what this vessel was used for, and it has been suggested that it might have been a lamp. Compare the present lot to a pair of spinach-green jade lamps in the Palace Museum, Beijing, illustrated in Zhongguo Yuqi Quanji, vol. 6, no. 64. The thinness of the walls and the angular style of the lotus petals on the present lamp owe their inspiration to the decoration found on Mughal jades which the Qianlong emperor admired. 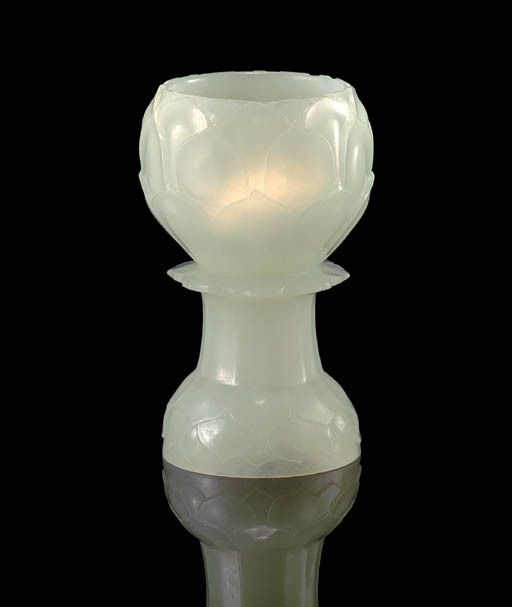 See for a comparison, the grey Mughal jade zhadou with overlapping petals on the rounded lower body, illustrated in Jadeware (III), The Complete Collection of Treasures of the Palace Museum, Hong Kong, 1995, pl. 243.